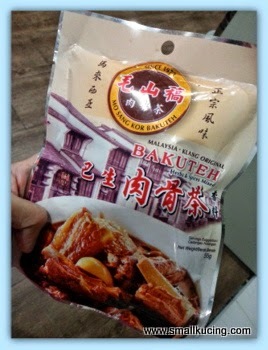 Some time ago, Auntie CC gave Mamarazzi a packet of Bakuteh. It's the famous Mo Sang Kor BKT. She kept it so long coz she was lazy to cook BKT at home as lots of work involve. Mamarazzi loves BKT especially with a lot of intestine and stomach but she doesn't know how to clean them. Looks like gotta call Sifu Elin. Her Sifu told her not to cut the intestine. Get a small onion and sumbat it into the intestine a few times. Then the let water go through the intestine to clean it up. Throw the intestine into the soup and cook without cutting. When wanna eat baru cut the intestine as it will shrink when it's being cooked. As for the stomach, have to scrape it clean. 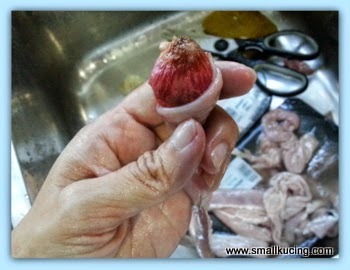 Sorry no photo as Mamarazzi was lazy to snap photo liao after cleaning the intestine. Hand stinky. After scraping the stomach clean...them cover it with lots of flour and throw into a heated wok/pan to sear it. Lastly, wash away all the flour and there won't be any stinky smell for the stomach. Cut and throw into the Bakuteh soup. The end result. Soup have very strong herbal aroma. Taste better if it was left overnight. true enough, the intestine and the stomach doesn't have stinky smell after going through the method taught by Sifu Elin. Me? I don't like the meat but I like the soup. Wow..is that the secret to nice bkt ? I love soup! But think I would prefer some other type of protein in it. Your mom can cook anything and make it taste god! The small onion need to tear off the outer layer before sumbat or not? Good job Mamarazzi! Thank you for sharing the tips from sifu Elin! Great tips, mamarazzi. But I dont take intestine, just pork ribs, soft bones, lean meat, tau pok in my bkt. Hehe. Pig stomach soup, yay! Yumm, I had that for confinement once every few days.. Pig stomach, intestines, and upon my request, I asked to add some liver and kidney inside too.. Really WOW for me.. I remembered confinement aunty cleaned it using ginger.. I dunno how she did it, coz all I did was to sit at the living room watching YouTube.. I think she pre-boil everything with ginger and water, then she did something else, before really boiling the soup.. I really love pig stomach soup.. But it makes me sweat a lot after drinking it la.. I mandi 5x a day during my confinement leh.. No joke.. Thank for visiting, it been a long time since we visited each other. My mum in law uses a garlic clove. wah, really a lot of work leh if cooking BKT with the intestines and stomach.. and i know it's super troublesome to clean them, if i were to cook, surely will omit these two things.. or perhaps just go buy those that were already cleaned lor..
wow, Mamarazzi's BKT is really loaded!! 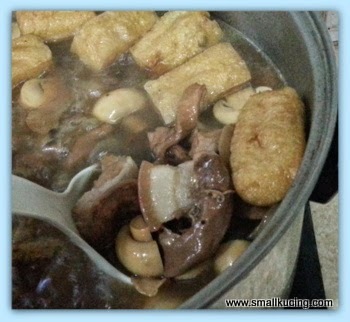 errr, i don't usually eat the meat and the intestines also, but i just like the toufu pok and mushrooms.. those fat meat not for me lah, but i do like them if they are the ribs.. of course, i love to pour the soup into my bowl of rice and eat it just like that.. Thanks for the sharing the tip and these are my favourite in BKT... but myself too lazy and its messy too. It is possible to get already cleaned ones from the butcher at my market. I love to eat BKT but not the intestines as it has so high cholesterol and fats, Bluek. I would drink gallons of its herbal soup and just meat. So nice! What is there that Mamarazzi doesn't cook or bake on earth? She is so talented! The bkt is my fav brand too. Never cleaned stomach before. Usually buy those already cleaned. I love love bkt. I don't know how to clean those intestines one, but I am good at eating them, LOL! I have never eaten intestine or stomach. Probably won't ever... LOL... I will save it all for you.